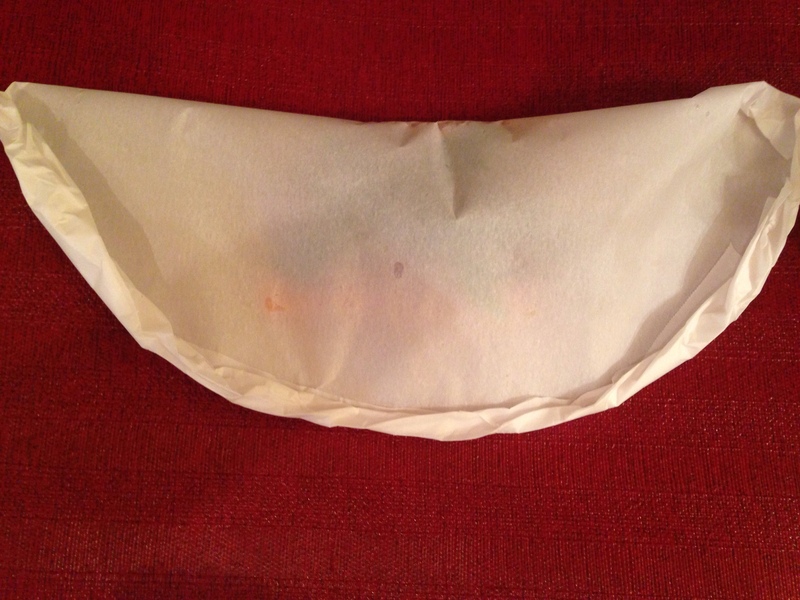 My first exposure to En Papillote was about 10 years ago at a dinner party hosted by friend Philippe. As his name sounds, he is French, from Paris. I don’t remember how he seasoned the fish, other than he came around to every person adding a dollop if creme fraiche on top, but I do remember it was quite a presentation. A few years later I read about En Papillote in the cookbook, Jacque and Julia (Pepin and Child, respectively). They each had their own techniques and well I tried both and can say that it looked much easier in the book. With some perseverance, I’ve been able to create nice packages in the shape of a half moon. I think you’ll find it easy to replicate. This recipe calls for Kalamata olives as a key seasoning ingredient. 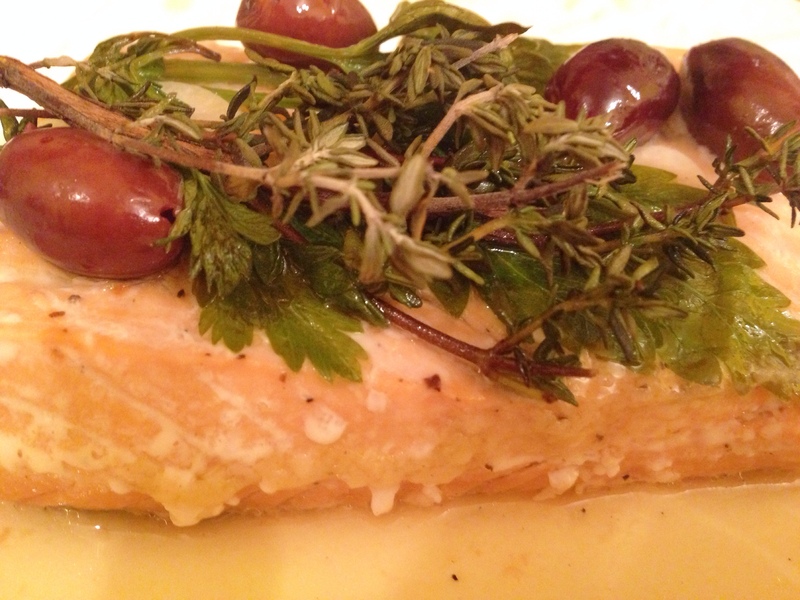 The olives mix well when it steams with the lemon juice, oil, garlic, parsley and thyme to create a savory flavorful dish. When working with En Papillote, the trick is to create an air-filled packet with the paper that provides a vessel for steaming the fish with the juices so the fish absorbs the flavors. Rather than the dollop of creme fraiche, this packet is topped with full sprigs of thyme that your guests can remove before eating. It adds great flavor and makes for a nice presentation. To create the half moon packets, take a sheet of parchment paper about 15″ x 15″ and place the fish so that the top horizontal edge lines up with the middle so that the entire fillet is placed in the bottom half of the sheet. Salt and pepper the fillet, then squeeze the juice of the lemon quarter over the fish and add 1 tablespoon of olive oil (I use EVOO). The oil may run a bit but that is fine. Lift the paper up so the oil moves closer to the fish. Then place 3 thin slices of garlic on top, followed by 3 sprigs of parsley (I use Italian parsley), and 2 sprigs of thyme. Then place 4 pitted Kalamata olives on top. When you’re ready to create the packet, fold the top half over the fish and bring the edges of the paper together by holding the center portion and crimp it with your hands bu folding the paper in small increments up in sort of a roll, and moving the crimp up the left until you get to the edge. Fold the end tighter into the crimp. Then go back to the center when you started, and crimp the right side in the same way you did the left. You’ll end up with a half-moon shape. Repeat with the other fillets. This can be done several hours ahead and placed in refrigerator to store and taking out a few minutes prior to cooking. Salt and pepper the salmon fillets. 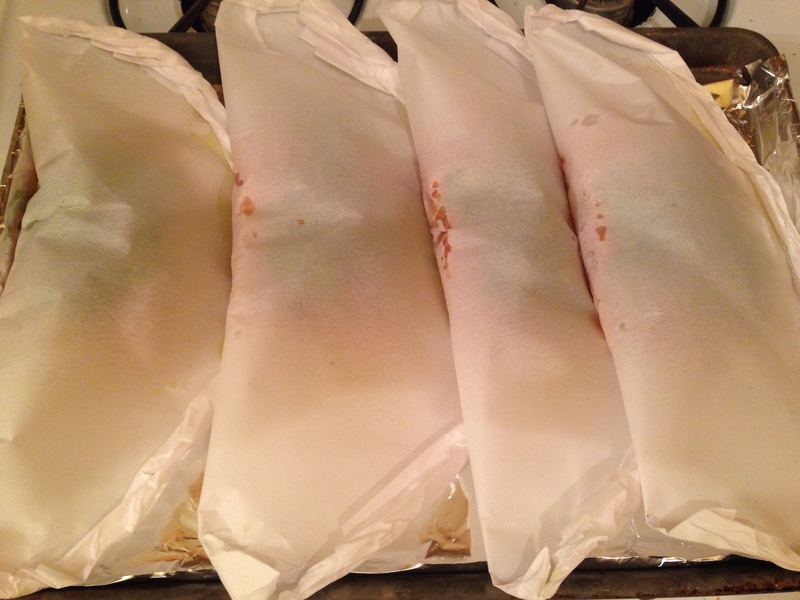 Place one salmon filet in parchment paper so that the top of the horizontal filet meets the middle of the parchment paper. 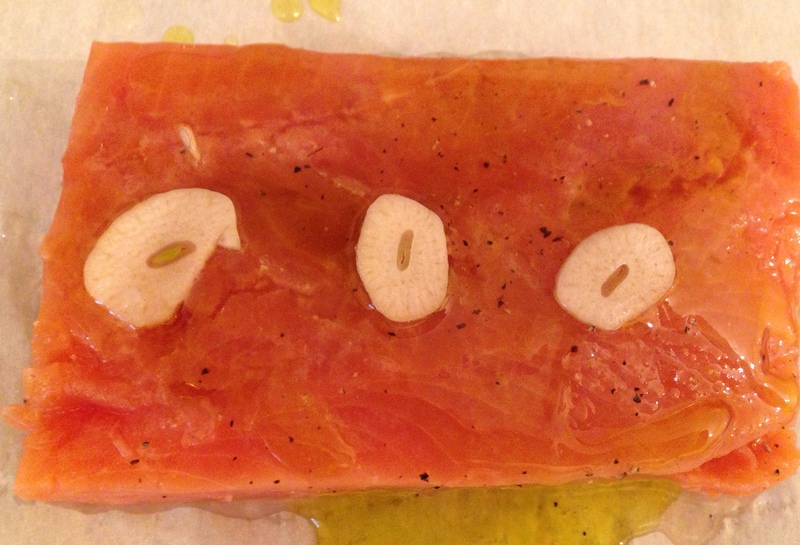 Squeeze the juice of 1 lemon quarter on top of the fillet, followed by drizzling 1 tablespoon of the olive oil. Place 3 slices if garlic on the fillet, then the parsley sprigs followed by the thyme. Place 4 olives on top. Fold the top portion if the parchment over to meet the bottom portion and crimp the edges tightly starting in the middle and working your way up the left side and then from the middle, crimp the right side into a half moon shape. Preheat oven to 400° and bake the fish for 15 minutes. Serve each guest one parchment package. 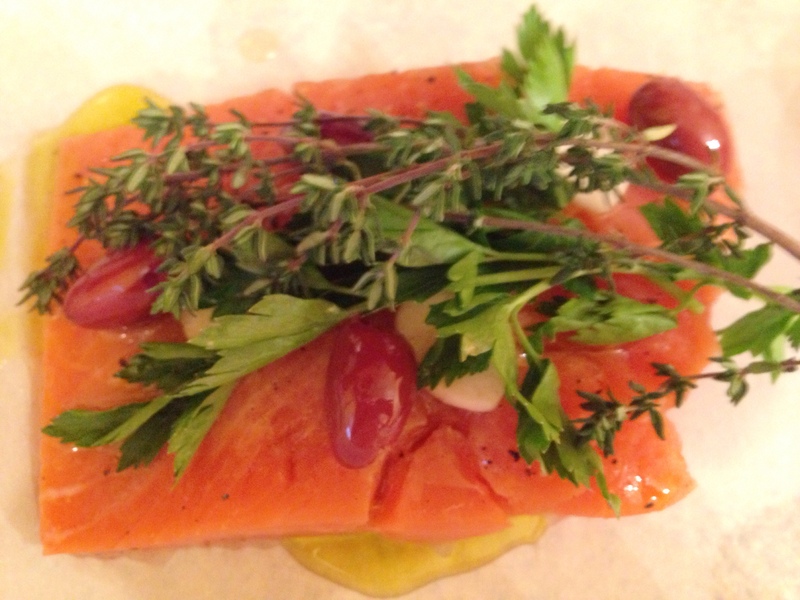 This entry was posted in Blog, Recipes and tagged gluten free, Kalamata Olives, Salmon En Papillote on January 5, 2014 by Leslie. Thanks for the New Year kick-off – I’m gonna try this one!